When it comes to human beings, it’s best to never use the word never as there are always going to be exceptions to the generalities. This photo is a good case to show what I mean. 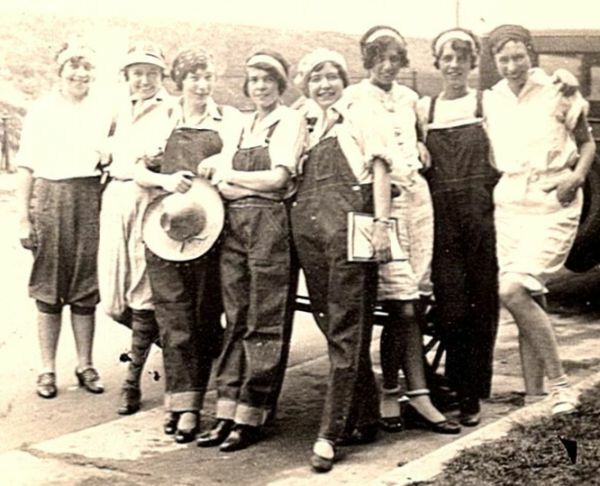 Except for women on ranches and farms, and except for performers, and except for women climbing mountains, and except for women wearing pajamas on beaches, it is pretty much accepted that women did not wear long pants in public before the 1930s. But check out this girl squad and their long overalls. Of course we know young women have long raided the closets of their brothers, but these pants all look new, and were maybe bought for the occasion. 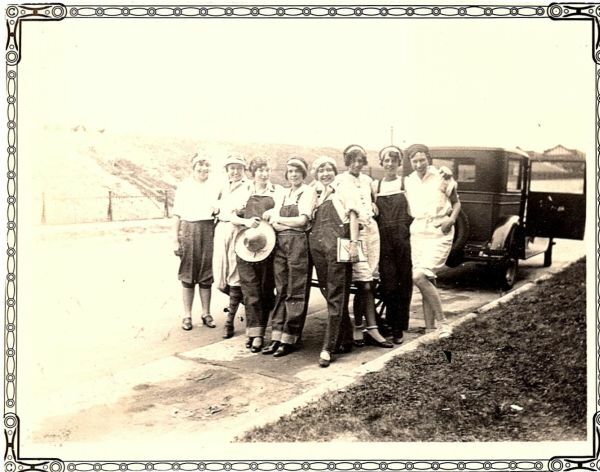 There’s no date on the photo, but my best guess based on the hair styles and shoes, is late 1920s. Probably even more surprising than the overalls is the one girls who appears to be wearing shorts. And check out her rolled stockings. This is one of those times when I’d gladly pay to know what exactly was happening in the photo. The presence of the book being held by one of the girls might be a clue. I’ve never been much of a fan of glitter, and now there’s a good reason not to consume glittery products. In conjunction with a new exhibition at the Museum at FIT, they will be livestreaming a symposium on the topic, Fashion and Physique. February 23, 2018, starting at 10:00 am EST. Wearing black to the State of the Union seemed like a good idea, but not so much so in retrospect. If you are wanting to travel the world with a “small mountain of Louis Vuitton luggage“, the estate of Zsa Zsa Gabo has you covered. There are some really good reasons why all the wonderful resources out there have not been digitized. Had this been published on April 1, I’d swear it was a joke: bustle baskets for cats. Want to see a short video inside the Christian Dior archives? The Massachusetts Historical Society has a Kickstarter campaign to help out with a new exhibition and book, Fashioning the New England Family. Read this article about art/fashion merchandise only if you can’t be driven batty by the excessive usage of the term merch. And finally, I know that not all old textiles need to be preserved in their current state. It’s a rare visit to the Goodwill bins that I don’t spot at least one old quilt. Even so, this makes me uneasy. I’ve only read the last piece so far, but I found that very interesting. It also makes me feel queasy, although to some degree she is correct in asserting that many old textiles have no chance of being preserved. Thanks for posting this. Ditto on the quilt article. The preservationist in me cringes at the idea of cutting up historic textiles, but when they’re badly damaged I do think that the currently ubiquitous “repurposing” is justified. And it did say that she records the history of each piece. It may not be the 1st of April now, but I wonder about the original publication date of that cat basket bustle article. I’m sure if such a thing really existed there would be a photo or picture of it somewhere, and we would have heard of it before now. She does cite two different sources, but who knows?! If the cat bustle was that popular it would have seen the light of day – especially as a cartoon. I have seen all sorts of things perched on and hidden by a bustle but never a cat in a basket. I have never heard of the cat basket bustle and I think the original article was more likely to be a lampooning satirical comment on the bustle which in 1887 was at its most extreme and exaggerated silhouette. Victorian newspapers and magazines often portrayed new fashions as social satire with articles and illustrations. Love to be proved wrong since it conjures up a great image! The rolled socks on the one girl immediately caught my eye. It looks like it took a lot of work to get them so even! And the quilt article…in some ways it breaks my heart that she uses quilts from dealers. But those you find at Goodwill–I say, go for it. The quilt thing is disturbing, although if a quilt is in terrible shape and not something special, why not reuse it instead of tossing it? The bigger question is whether other designers will copy her and not care where the quilts come from or how intact they are. 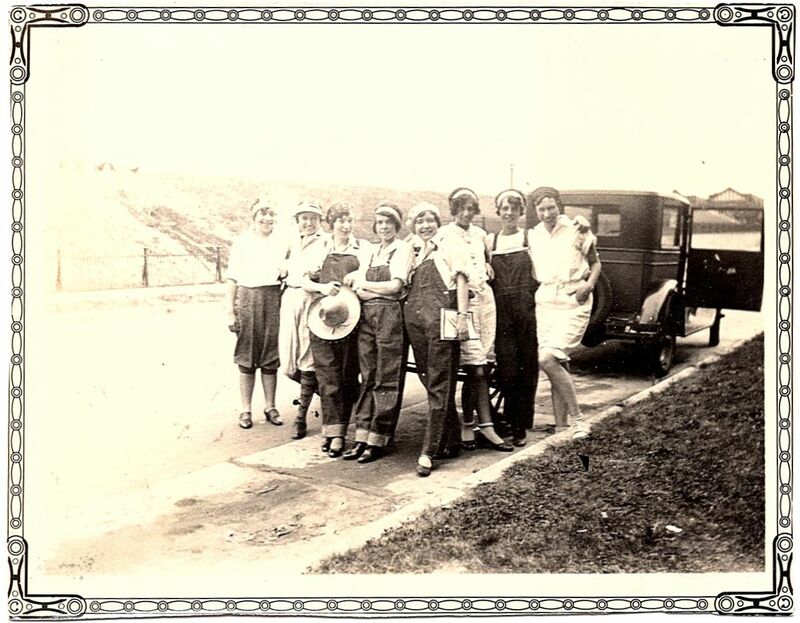 Lizzie, with regard to dating the photograph with the young woman in long britches, I wonder if a car enthusiast could provide a date for the vehicle they are clustered around? Excellent idea. I’m working on it!